The application is open until December 15, 2017. 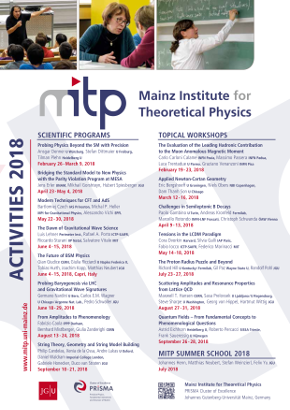 With the advent of the new MESA facility in 2019, Mainz will become a forefront laboratory for testing the Standard Model and beyond with low-energy parity-violating electron scattering (PVES). The main focus of the PVES program with MESA is a 1.5 % measurement of the proton’s weak charge. There is also the possibility of a 0.3 % measurement of the weak charge of the carbon-12 nucleus. Along with solving the purely experimental issues, this will require that the theoretical Standard Model calculations have an adequate accuracy. The main goal of such this scientific program will be to lay out the theoretical foundations and possible impact of this experimental program. Parity violation in atomic systems with the goal to determine weak nuclear charges and anapole moments in isotope chains. The interpretation of experimental results will ultimately also require a good knowledge of the neutron distribution in heavy nuclei. The physics of neutron skins. Corresponding measurements will be performed with PVES at MAMI and MESA. Ultra-cold neutron beta-decay with the TRIGA facility at Mainz and super-allowed nuclear beta decay and the extraction of the CKM-matrix element Vud.